Many Jewish holidays are a celebration of religious freedom. You know the mantra – they persecuted us, tried to kill us, we won, now let’s eat. Purim is another one of those holidays but it is sooo special. I love Purim. It is my favorite Jewish holiday. I enjoy shopping for and making my own Mishloah Manot baskets, creating beautiful gifts. I love the stores in Brooklyn, how they cater to the holiday with inexpensive baskets and boxes, synagogues sell premade baskets in all shapes and sizes and the economy is driven by these baskets. Even the 99 cent plus stores have Purim sections, with candy, grape juice, noisemakers and other items for the baskets. I love seeing everyone dressed in costume, getting wonderful Purim surprises when I get baskets, visiting friends and neighbors to present the baskets I make, and of course fulfilling the obligation to give to the poor. Purim is special because it a celebration of religious freedom from over evil. Haman, greedy and selfish, full of himself, is much like an early Hitler, only the time and place are different. Esther is Queen in the Persian Empire and she is guided by her ‘uncle’ Mordechai, ultimately saving the Jewish people from obliteration. During Purim, the Festival of Lots, the Scroll of Esther is read in the synagogue and it is the obligation of every Jew to hear it twice. It is obligatory to give charity to the poor and the sending of Mishloah Manot, gift baskets that must contain items for two different brachot. It is traditional to eat and give hamentashen, pastries shaped with three cornered to represent the hat of Haman, filled with fruit. 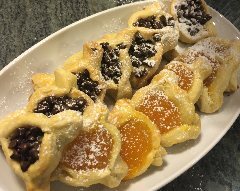 I have used my this Hamentashen recipe from my Aunt Rose Missry A’H for many many years. Enjoy!